Ulysse Nardin Vintage Diver. IN STOCK. 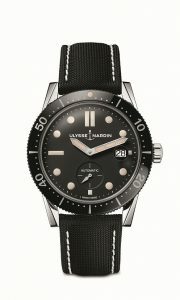 42.2mm, polished stainless steel case, automatic movement, with date and solid stainless steel case back. This sporty vintage looking timepiece features a 42 hour power reserve movement with the latest in Ulysse Nardin Silicium technology. Available on sporty canvas strap with regular pin buckle.